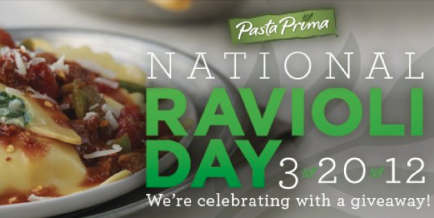 In honor of National Ravioli Day, Pasta Prima is hosting a giveaway. Through April 20th, go to the Pasta Prima Facebook page, “like” them and click on the Ravioli Day Giveaway tab. On or around April 27th, 5,000 randomly selected entrants will each snag a coupon for free Pasta Prima (up to a $4.49 value!). In addition, the first 20,000 entrants will each snag a Bricks coupon for $1.50/1 Pasta Prima Ravioli.